This article is about the summon stone. 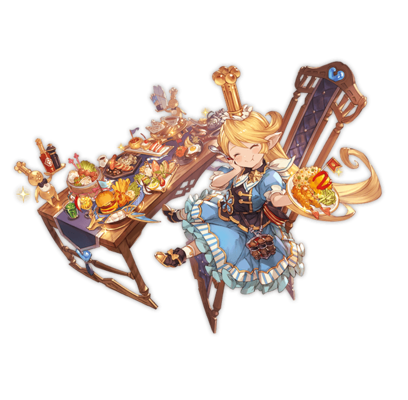 For the character, see Charlotta. Little Skyfarer a la Sacre Blumiel! Hamburger steak and fried shrimp and pilaf and melon soda—and don't forget the banana juice! Everything's so delicious... I can't stuff my cheeks fast enough! Come on, everyone! Grab your Little Skyfarer's Lun—I mean Big Skyfarer's Lunches—before they get cold! You'll discover the strength of the glorious, the honorable... the Lumiel Order of Holy Knights! Sacre Blumiel! 10% boost to all allies' DEF / Taste the glory of the Lumiel Order! (Boost to ATK for Lumiel Knights)Verification needed. 20% boost to all allies' DEF / Taste the glory of the Lumiel Order! (Boost to ATK for Lumiel Knights)Verification needed. Duration: 3 turns) 9T9 turn cooldown.